Thank you to the 22 players who came out to play yesterday. Our game was Three 6″s. Congratulations everyone! Thanks for playing and thank you Dana and Annette for all you help. Hope to see everyone next Tuesday. We have an ever growing group of 18 holers, fantastic. Below is my first Rules mailing of the year and I chose it as it addresses questions I have been asked a number of times, especially about “grounding your putter in front of the ball.” This comes with great graphics. To all of you, especially the new members, please feel free to e mail me or ask clarification on any Rules questions you have. I love questions, they keep me sharp, and it gives me an idea of what I need to cover in my mailings each month. Remember knowing the Rules can cut strokes from your score so, know them and use them! a) Do they incur a penalty if they do not press anything down while doing so? b) Do they incur a penalty if they do press down on the putting surface while doing so? Exception (ii) to Rule 16-1a permits a player to place their club in front of the ball when addressing it, providing they do not press anything down. 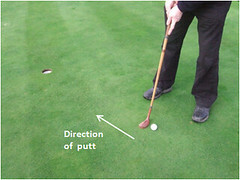 On a calm day with no wind, a player’s ball moves after they have placed their putter head down in front of it as part of their putting routine. Do they incur a penalty even if their club did not touch the ball? Yes, the player incurs a one stroke penalty under Rule 18-2b. Exception: If it is known or virtually certain that the player did not cause his ball to move, Rule 18-2b does not apply. If a player forgets to lift their ball marker when they replace their ball and then putt, do they incur a penalty? Note: Under Rule 20-4, a ball is in play when it is replaced, whether or not the object used to mark its position has been removed. 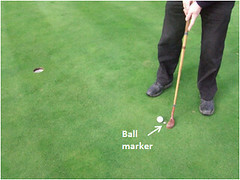 Providing a player is not using their ball-marker to indicate their intended line of putt there is no penalty for leaving it in place while putting.